In small bowl, combine vinegar, mayonnaise, mustard, salt and pepper; beat well with wire whisk. Slowly beat in oil until well blended. Cover; refrigerate until serving time. Just before serving, in large bowl, toss lettuce with dressing. Divide evenly onto salad plates. Sprinkle each with cherries, cheese and walnuts. 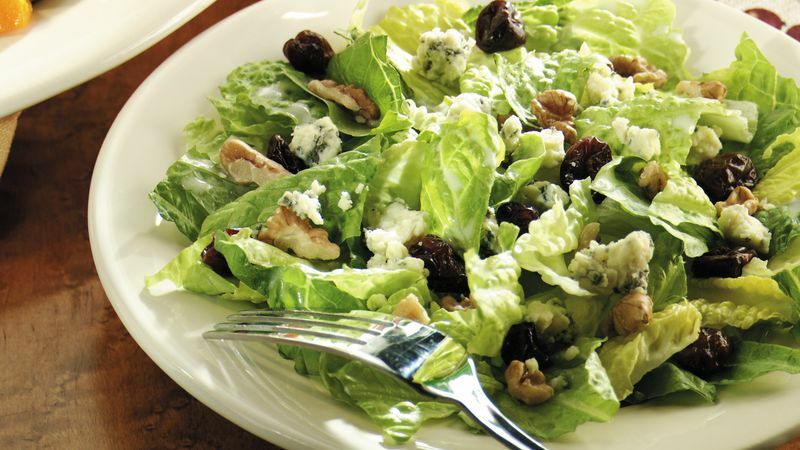 Another creamy blue cheese can be used in place of the Gorgonzola in this salad. Try Dunablu, Roquefort or Stilton. Try champagne, red wine or raspberry vinegar in place of the white wine vinegar. The Dijon mustard and mayonnaise hold together, or emulsify, the vinegar and oil. An emulsified vinaigrette means that instead of biting into a piece of romaine that tastes strongly of vinegar and another that only tastes of oil, the flavors are blended correctly on each leaf.